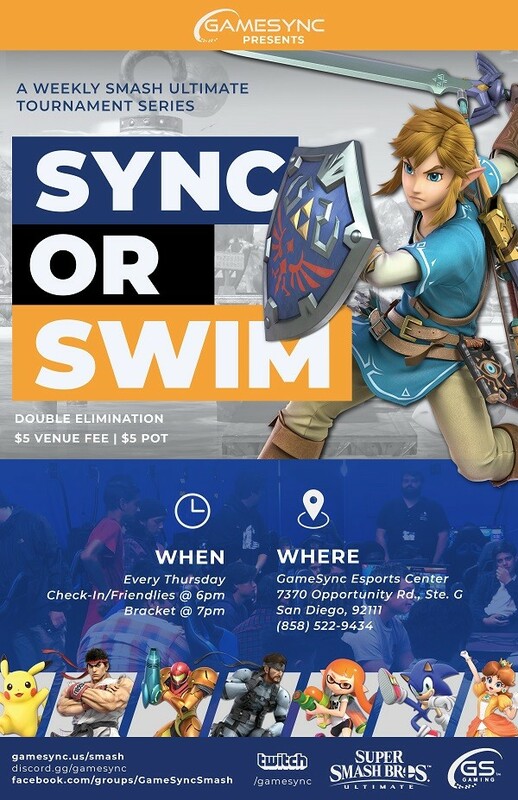 Come join us for San Diego’s largest Smash weekly and one of the biggest on the West Coast! Whether you’re new to the FGC (fighting game community) or you’re a seasoned Smash 4 player from the WiiU days, you’ll have a blast! Check in starts at 6pm. Pay at the door ($5 venue fee, $5 towards the prize pool) and hang out and meet other players or engage in some friendlies. Then at 7pm, the fireworks begin with double elimination brackets run by your veteran TO (tournament organizer) Sam Glick. Cash prizes are awarded at the end of the event. We’re streaming our entire Smashfest every week at twitch.tv/gamesync. Stream typically starts after 7pm with the official brackets. Live commentary is offered from experienced local casters and we’re capturing the game in 1080p 60hz for optimal clarity. With viewers from around the USA, we warmly invite you to join us every Thursday night! If a game goes to Sudden Death, the winner is determined by stocks and percentage at the time the game ends. If both players are tied in stocks the player with the lower percentage is the winner. In the event of a percentage tie, or a game in which both players lose their last stock simultaneously, a 1 stock tiebreaker will be played with a 3 minute time limit. The results of an in-game 300% Sudden Death do not count. If Sudden Death occurs in a Sudden Death game, this process is repeated. Taking an partner’s stock is allowed in doubles. Anyone who is not present for their set by 15 minutes past the scheduled start time is subject to a total disqualification from the event. See section 1.5 for details on choosing who strikes first. Players may strike from the legal starter stages (each person strikes stages in a 1-2-2-1 format) to determine the starting stage for the first game. If battlefield or final destination is chosen and both parties agree, a variant can be used. This is a book on how competition in gaming works and having a “play to win” mentality. This means taking responsibility and accountability for everything you do and not putting excuses that only hold you back. There’s also a bit of competitive fighting game theory in here. Written by one of the world’s best Street Fighter players, Daigo, this book talks a lot about consistent growth, the benefits of staying humble, innovating, taking risks, and how to play with the mentality of learning and growing rather than focusing on just the win. Despite having the word ‘Winning” right in the title, the book teaches the value of focusing less on the results and more on the process. by W. Timothy Gallwey et al. Yes this is a book on Tennis but it talks about the inner workings of your mind and how to get the best out of competitive performance and practice. Very much worth the read. This is a directory discord chat rooms (with and without audio) for discussion and support from fellow Smashers. I’ve found a lot of great resources through these chat rooms. Not all chat rooms are the same, look through them until you find one or more that works best for you. Traveling for Smash? See these tips.